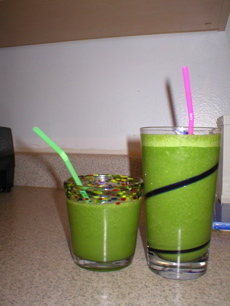 A green smoothie can be made into a raw vegan milkshake simply by adding a nut milk to make it richer, creamier, and heartier. Can't do dairy, don't want to do dairy... but still want that creamy goodness? No problem! Nut "milks" contain no animal proteins - they're simply nuts and water blended and strained. As with regular green smoothies, this drink is an easy and delicious way to get more of those greens and their powerful nutrients into your body. Like many raw whole fresh foods, there's no need to measure. Use your instincts and experiment to make it just how you love it. Any superfood powders you like, such as VitaMineral Green or Earth (optional). 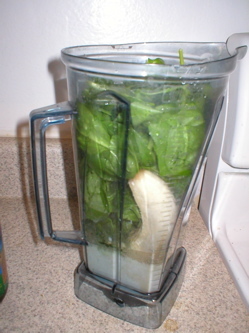 Blend at high speed in your blender until mixed and enjoy immediately for maximum freshness and nutrition. Make the milkshake THIN (add more milk or water) and treat yourself to a green sweet milk (as you would a chocolate milk). Or make it THICK (add more ice or a second banana) and it's like a green eggnog, creamy and yummy, especially nice in winter. You could even add CHOCOLATE powder (preferably raw cacao) and fresh mint and make it a chocolate mint milkshake! Mmmmm. Who says you can't eat healthy and still feel indulgent? Onion Bread With No Baking?